I have a pretty long-running obsession with projects that use slipped stitches with the yarn in front so that the extra yarn becomes a decorative feature in the project. I knit a baby blanket this way that’s still one of my all-time favorites, and there’s a project in my new book that uses slip stitches on the bodice of a dress. So there was no doubt I was going to love the Reindeer Tracks Cowl pattern from purl3agony. It uses slipped stitches on two consecutive rounds through the pattern, which makes tracks across the knit fabric. 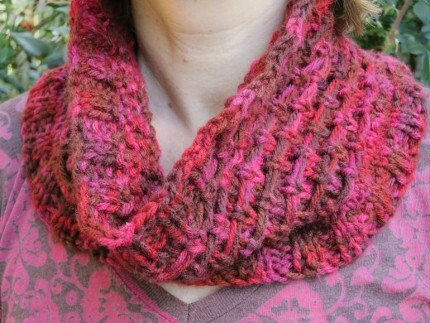 The pretty yarn is Caron Simply Soft, which is widely available and inexpensive, making this a great gift idea. Make one for yourself, and one for a friend! Sarah! Arrrgh!!! Not another super pretty pattern!!!! I don’t have tiiiiiiimmmmmmmeeeee! Seriously, thanks for the link!